By Miłosz Panfil - PhD. 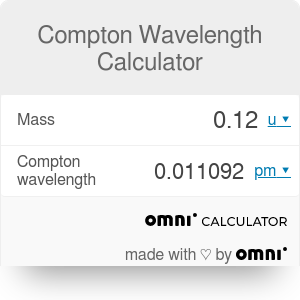 With the Compton wavelength calculator, you can quickly compute the Compton wavelength of any object knowing just its mass. Keep on reading to see what is the Compton wavelength equation and how it relates to a fundamental limitation on measurement. λ [m] is the Compton wavelength. Compton wavelength is a distance at which we should use the Quantum Field Theory instead of simple quantum physics. Quantum Field Theory is a theory which puts quantum physics together with special relativity. One of its predictions is that particles can be created out of the vacuum. The Compton wavelength sets the distance at which such processes are feasible. What does the creation of particles from the vacuum have in common with a limitation on measurement? Let us ask where the particle is. To answer the question, we could shine a light on the particle. To be able to localize an object the wavelength of the light should be comparable with the size of the object. If the particle is small, it means that we need to use photons of considerable energy. To see an object, the photon must collide with it. However, if a photon has a lot of energy, the collision might have drastic effects. For example, if the photon with energy larger than mc² strikes an elementary particle of mass m (like an electron), it might lead to the creation of particle-antiparticle pairs. If that's the case, the initial question "where is the particle" becomes nonsensical: now we have two particles and one antiparticle. Trying to localize better the particle we made the situation worse. This is the limitation on measurement the Compton wavelength provides. So what is the Compton wavelength of elementary particles like an electron and a proton? It is easy to answer this question with our calculator. For an electron merely choose the mass units to be electron mass. In this units, the mass of the electron is, well, 1 me. The resulting Compton wavelength is 2.42631 pm. For a proton choose the mass units to be proton mass units. The resulting Compton wavelength is 0.0013214 pm. De Broglie wavelength is a similar quantity which gives a typical distance in which quantum physics takes over the classical picture. Compton Wavelength Calculator can be embedded on your website to enrich the content you wrote and make it easier for your visitors to understand your message.